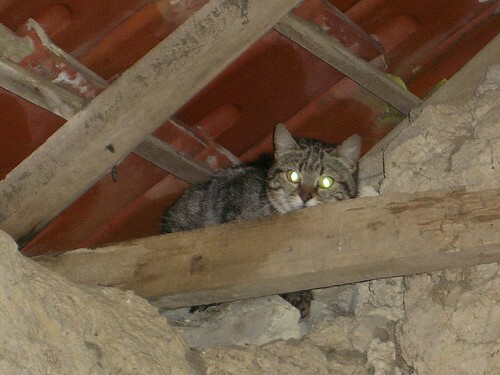 Several times during the last year we have spotted a tabby cat in the yard and roaming among the buildings. Given the quantities of rodents about the place we've been rather pleased to see it - our old cat can really only catch a vole if it runs into his jaws, something we have actually observed, voles are that stupid, but it doesn't happen often - and because the stranger seemed solitary and somewhat aloof, refusing scraps left out last summer we concluded that it was a male. 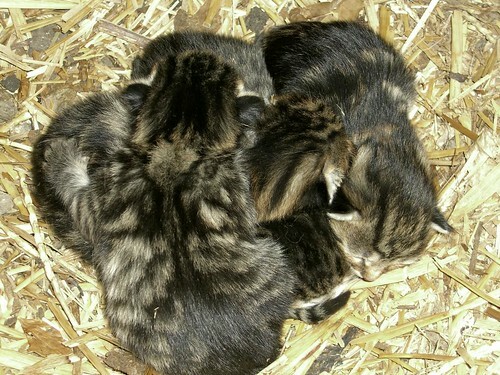 This is no bad thing, feral cats in rural France are pandemic and queens can produce more than one litter in a year. The deleterious effect on wildlife is considerable and besides too many cats lead to starving, disease ridden creatures who perish miserably in the cold winters. However, this spring, on an exploration of barns and outbuildings Paul had never visited, we chanced upon a darling nest of kittens. Absolutely adorable and completely alone when we spotted them, we tried not to disturb the beautiful babies but were unable to stop ourselves going back for another look the next day. This time the mother cat was there, our familiar tabby 'boy'. She didn't like the look of us and retired to the rafters of the barn. Next time we went to look the kittens were gone. We didn't try to search them out, but left Bagheera's scraps in a bowl near where we had first spotted them. This time the food was found acceptable, feeding four growing kittens leaves little room for feline pride and besides, Bagheera's food is always of the best even if he doesn't find it good enough. However, it raises some questions; now we have five cats on the farm we shall have to take steps to stop uncontrolled breeding. There is birth control for cats, medication that can be put in food if the cats are hungry enough to eat it but it's a very hit and miss process. Far better to catch the cats and have them neutered but that will be no easy task either. It's going to be a problem, but I must say I do love to see cats about the place and wish them well.